A mid 20thc sculpture of Bacchus, God of wine, in reconstitued marble, taken from the original by Jacopo Sansovino in 1512. He is depicted here holding a dish with his left hand and in his right hand he is holding a bunch of grapes. There is a small fawn behind him trying to eat the grapes. 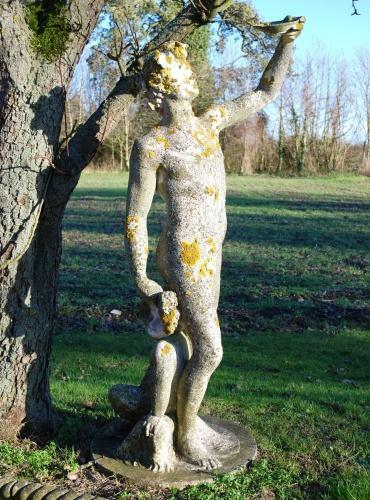 This piece is in good condition and has a weathered appearance with the evident lichen and is a great decorative piece either for a garden or a conservatory.